Are you all laughing as hard as I am? ‘Cause that post title is just plain funny. Weeks one and two of 2013 were ANYTHING, ANYTHING but simple around our house. Week three isn’t going to be simple either. And that’s pretty much the point of this series. Life’s never simple. Finding joy and simplicity is about setting yourself up for success and getting ready to roll with the punches. Last week, after working so hard to put together our new entertainment center in our family room, we noticed enormous swelling in our bull mastiff, Briggs’, neck. The next day we got the news that he has high grade lymphoma. We’ll see an oncologist on Tuesday but we’re trusting God is leading the way here no matter what the outcome. Then, on Friday, we found out Brady’s multiplying bug bites were actually chickenpox. (WHAT!?) Strangely enough, it’s a strain of chickenpox that isn’t contagious, doesn’t itch and doesn’t cause fever. Well, thank goodness. He’s fine and his bumps are fading. Amid all of this, we were revamping my office, our family room and replacing the only two rooms of carpet in our house (Brady’s room and our guest room). Needless to say, our house was turned upside down. Clutter / mess in my house = clutter / mess in my head. Last week it was punch, after punch, after punch to the stomach. To the point where I was just about ready to cave. I was exhausted. Physically and emotionally exhausted. I took this photo right before we noticed the swelling in Briggs’ neck. 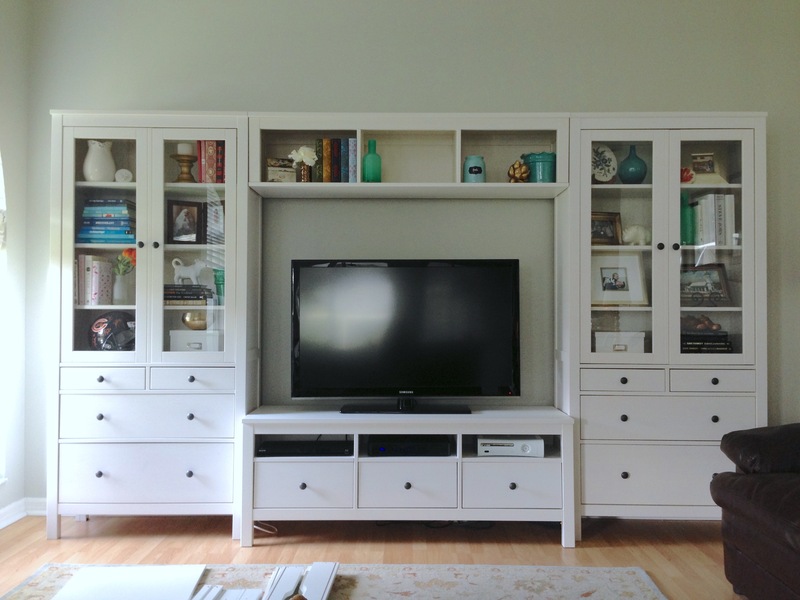 It was one of our goals to create a more open, functional, comfortable family room for all of us to enjoy. The fun was bittersweet though as we worried about our pup. Real life, y’all. Real life. Can I get an amen? And let’s be honest, it could have been a lot worse. 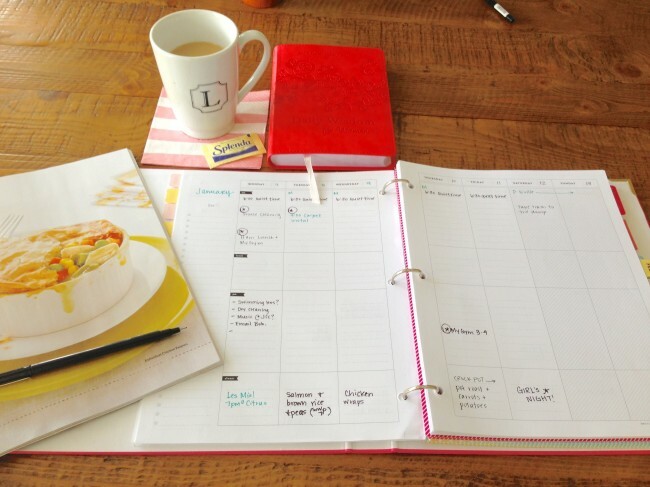 The point of this blog series isn’t for you to see my pretty Simplified Planner. It isn’t for you to see how perfect I am or how perfectly clean and organized my home is or how neat my handwriting is. Because none of those things are true. (My mom’s a third grade teacher and has immaculate handwriting… why didn’t I get that from her!?) The point of this series is to open my front door and have you come on inside and have a seat at my big ol’ oak kitchen table with a cup of coffee (or a glass of cab, depending on the time of day). The point is to break down the walls that say WE HAVE TO BE PERFECT ALL THE TIME and laugh a little. To give ourselves some breathing room. To shed the super mom standards and make what matters happen together. To be your friend and talk together about ways we can set ourselves up for success in our homes, in our businesses and in life in general. So, listen, I wont post every week although I’ll try my darndest. Sometimes life will slap me in the face too and I’ll catch up just like I’m doing now :) And that’s ok. The only way to start my first post in this series is to lay down the foundations for what I want to make happen this year. My goals. Break my iPhone addiction. Be a present wife and mom. It’s ridiculous how addicted I am to my iPhone. I’ve already started breaking this habit by plugging my phone in to charge away from my bed on my dresser at night, turning Facebook and Instagram off on the weekends (well, I made it halfway through the weekend this time) and putting it in a drawer when I start cooking dinner. Have you seen the do-not-disturb feature? It’s awesome too. I also removed Hey-Tell from my iPhone permanently. I loved it (it’s like voice-texting) but it was starting to become another addiction. Cook dinner (or at least have a plan for it) every night. This is 100% happening because of my Simplified Planner Weekly Calendar pages (and their “Dinner” sections!) and Meal Planning Sheets. Eat clean and don’t be crazy about it. Once upon a time I weighted 115lbs. I was insane about my weight. I ate grilled chicken, lettuce, coffee and diet coke. That was about it. Then I got married and gave myself some room to breathe. I don’t weigh 115lbs anymore (thank goodness) but I do indulge a little too often. It’s the “I’m a Mom, I deserve comfort food after a long day” problem. Meal planning is helping in this area too. Grow in my marriage with Bryan. Be more for others as a couple. We have scheduled date nights for the next few months. Doing this far in advance gives us a chance to plan and make the most of our time away as a couple. We’re so bad about scheduling them on a whim (because there’s always a trip to Home Depot or the grocery store or something else really exciting that ends up taking precedence). So, Danica (our amazing nanny), McKay and I sat down with our three Simplified Planners™ (they have turquoise ones and I’m a little jealous! I have the pink after giving mine away to a media inquiry!) and chose date nights through March. Exciting! Find a church for our family. My friend Amy and I, who writes Lily and Bliss, have been trying churches the past few weekends while our families stayed home. We are using this approach so that we don’t have to leave our little ones in nurseries we’ve never visited. So far, we’re really liking a contemporary church near us. Our sweet hubbies have agreed to try the church we like the most. Focus. Focus on my business finances more. (Check out this budget spreadsheet I created for myself. It’s so useful and pretty :) And you can download your own free!). Focus on taking select work projects so that I can devote myself wholeheartedly to them. Focus on my mission within my shop (to create products that help women simplify life and find more joy in their treasures [see Luke 12:34]). 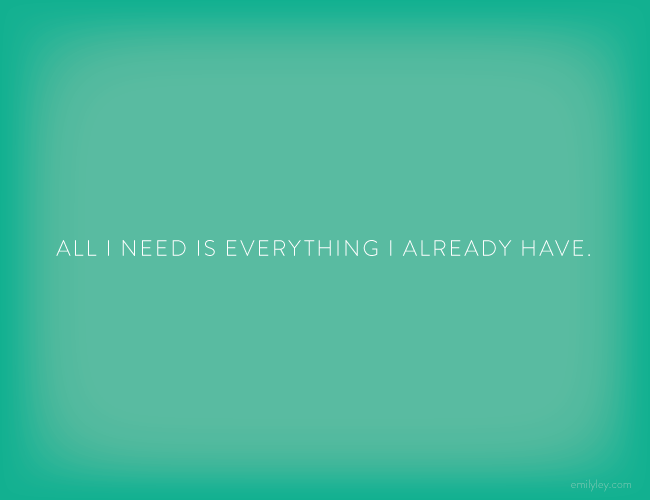 Find needs and meet them directly. This is a big one. GIVING is so important to me. So important. My background is in nonprofit management and fundraising. But besides that, the Lord built within me a spirit of giving and inspiring others to give. I know He wants me to do something with it. Over Christmas, you may have seen my Instagram post about the KitchenAid Mixer. Bryan and I overheard our waitress at a local restaurant talking to the table next to ours. She explained that she had five children and dreamed of one day owning a KitchenAid Mixer and baking cookies with her children during the holidays. Suddenly, I felt sick about the Starbucks Verismo and Bose Wireless IPhone Speaker I’d been eyeing for Christmas. So instead of gifts for each other, Bryana nd I headed to Bed Bath and Beyond and purchased a big shiny red KitchenAid Mixer, wrapped it and dropped it off at Outback anonymously with the waitresses name on top. I don’t tell you this story for any pat on the back. In fact, I don’t deserve any, it was God that put that spark in our hearts that day. Instead, I tell you as an example of a random act of kindness and giving directly. That excites me. I want to do more of this – with RAOK’s like this and meeting more NEEDS where we find them too. Alrighty, friends. Thanks for reading the longest post ever. We have a big week coming up. Our oncology appointment with Briggs is Tuesday. Gina Zeidler is coming to visit Tuesday also (HOORAY!) Tuesday night we’re going to see Wicked with a bunch of girlfriends (MY FAVORITE SHOW EVER). Wednesday, Lara and I begin our three part Making Brands Happen Webinar Series with Part One: Set Yourself Up for Success. Friday my parents come to visit for four days! Wishing you all a wonderful week ahead! PPS: Did you SEE?! 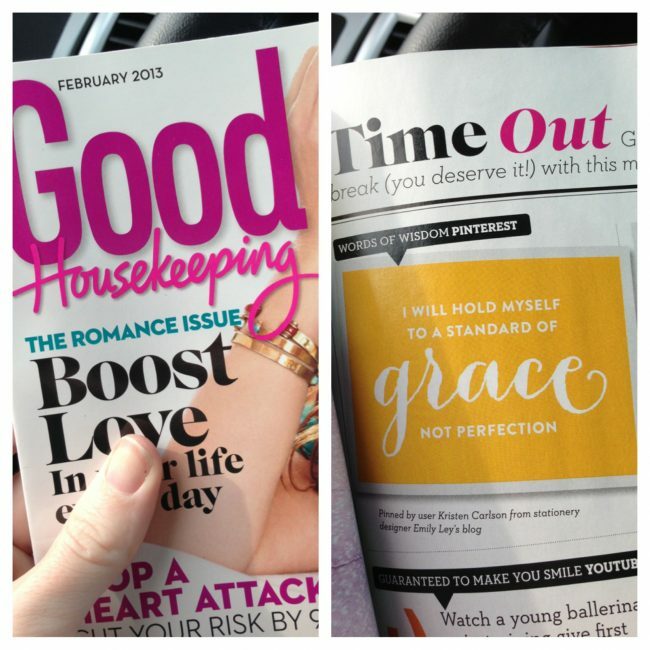 Thanks, Good Housekeeping!! Absolutely stoked to have our Grace Not Perfection print featured on page 27 of the February, 2013 issue!